This comprehensive guide, sponsored by the Institute of Physics, is intended for students, teachers, and parents. The site offers a searchable database providing access to thousands of approved physics-related websites that have been tagged for age and educational level; users can type in a keyword or question and specify their age and level of knowledge to obtain age-appropriate search results. Search results include a link to the website, a description, keywords, comments, and a site rating. 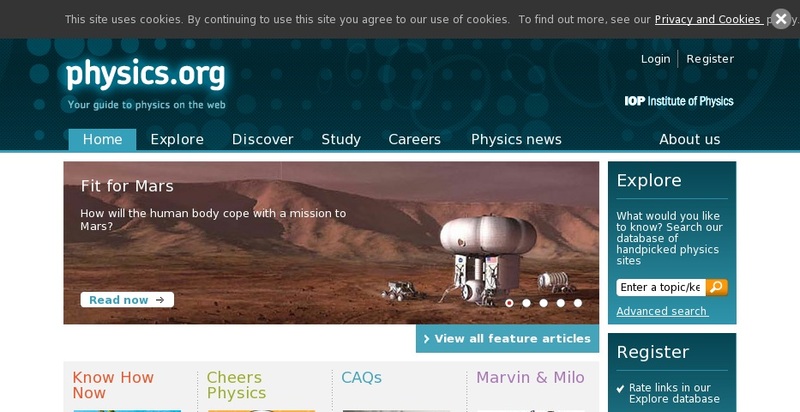 The site also features news articles, frequently asked questions, games and experiments, advice and information about studying physics at school and university (focused on study in the UK and Ireland), and information on events and activities.